I am a firm believer that certain books come to you at the perfect time and that was definitely the case with Outward Blonde! This book came to me at exactly the right time. Busy and getting busier, I was in dire need of a break! Enter Outward Blonde, a breath of fresh air! The character Lizzie definitely takes some getting used too, but I'm pretty sure that was exactly the author's intention. Cook did not want to you like Lizzie immediately. She is a spoiled brat, who I'm sure has the word 'entitled' written on her brand-name clothing tags! When sent to Camp Smiley, you can't help but love the torture that Lizzie is going through. I would have loved to have been there to personally witness some of it! I truly adored almost everything about Outward Blonde, the only thing that left me wanting so much more was the love interest. To avoid spoilers, I won't dive into much detail regarding this, but I just wish there was a little bit more to it. I know! Sorry for being vague, but you'll just have to read it to find out! 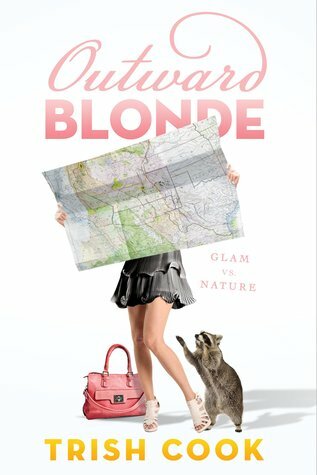 This novel is absolutely hilarious and loaded with laugh out loud moments, but it also addresses some tough issues that give Outward Blonde so much heart. You'll also see a shift in Lizzie, witnessing her personal growth as the novel progresses. Outward Blonde by Trish Cook is the perfect book to gift yourself! When you find that you are in need of a fun book with a great underlying lesson and lots of heart, then this is the book for you! Great review. I too find certain books set the pace or change the pace at certain moments. Does sound like a book which promises a good time.